Festubert is a village and commune in Pas-de-Calais, 8 kilometres east of Bethune. Take the D171 from Bethune to Armentieres, passing in front of Le Touret Cemetery. 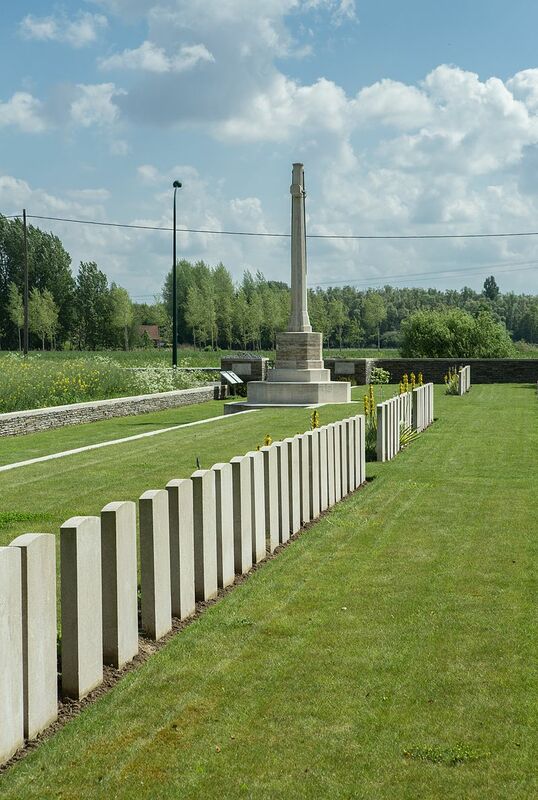 After another 2 kilometres turn right on to the D166 and continue into Festubert, approximately 2 kilometres. 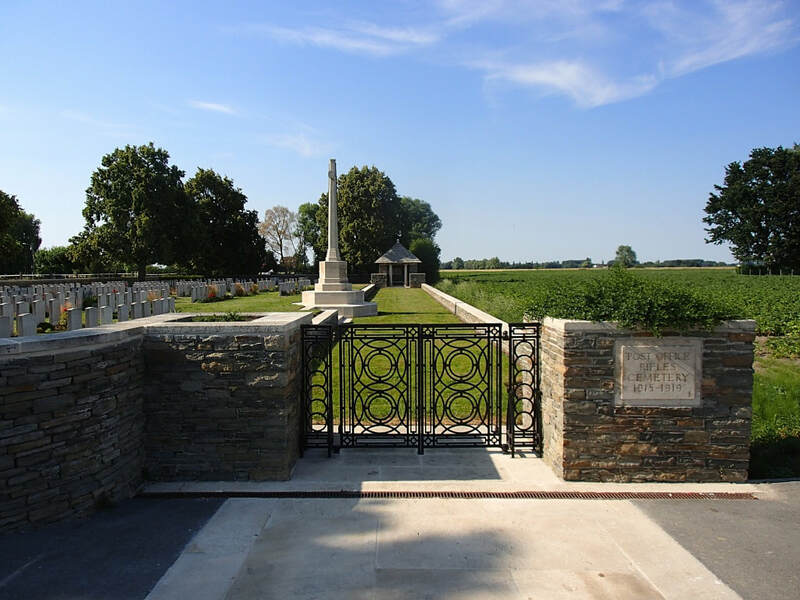 At the crossroads, take the right hand road (direction Beuvry) and continue for another 1 kilometre. 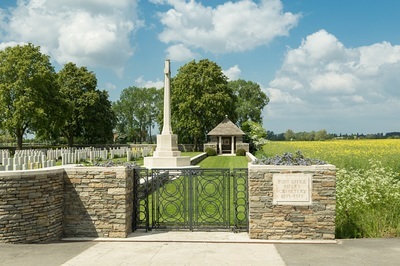 Post Office Rifles Cemetery will be found on the right hand side. 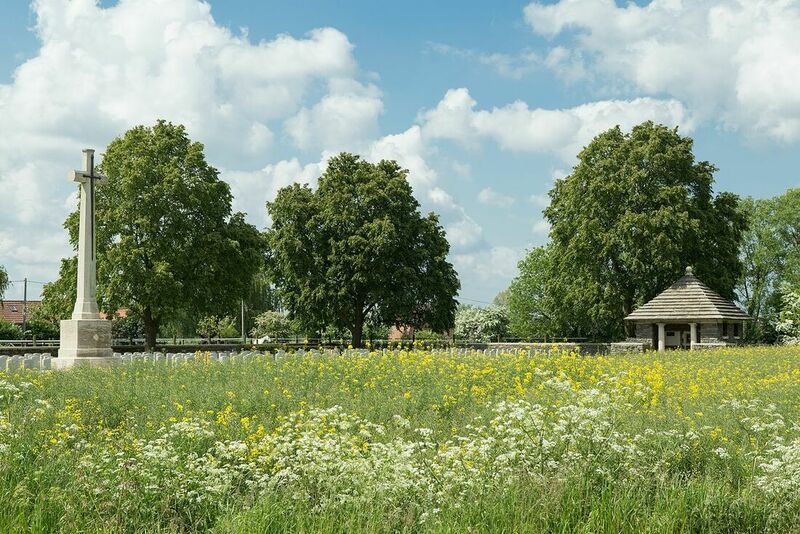 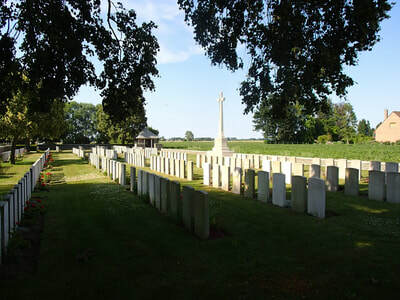 The location or design of this site makes wheelchair access impossible as there is one step to get up to the first part of the cemetery and a further four steps up to the area where the graves are located. 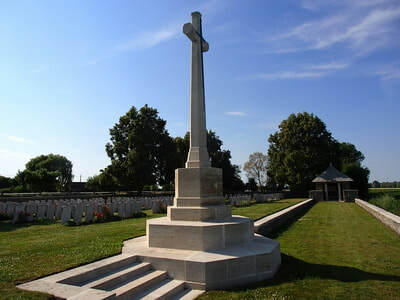 Post Office Rifles Cemetery was named after an English volunteer unit formed in the 1860s and composed mostly of Post Office employees. 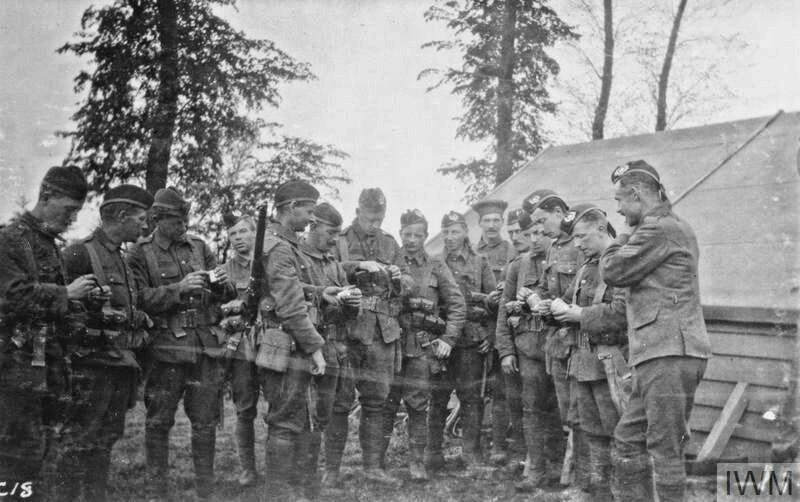 By 1914 the unit provided most of the riflemen for the 1/8th battalion of the City of London Regiment of the Territorial Force. 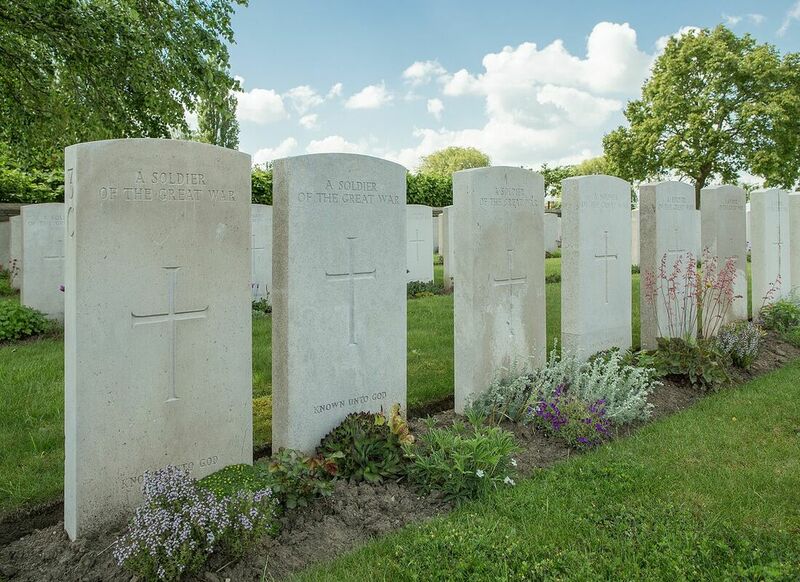 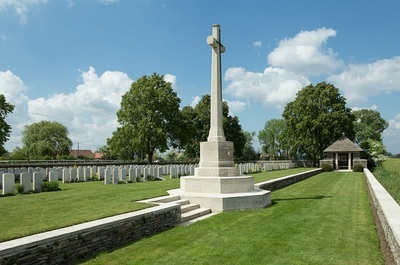 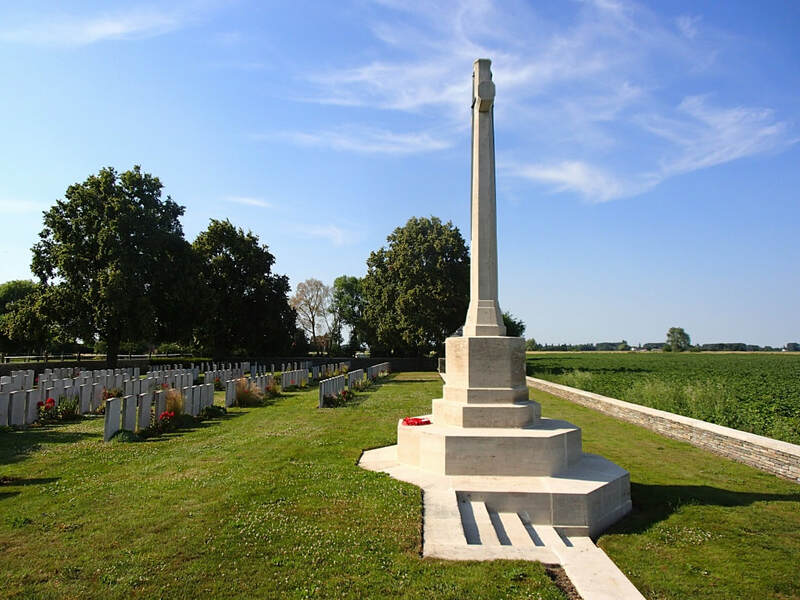 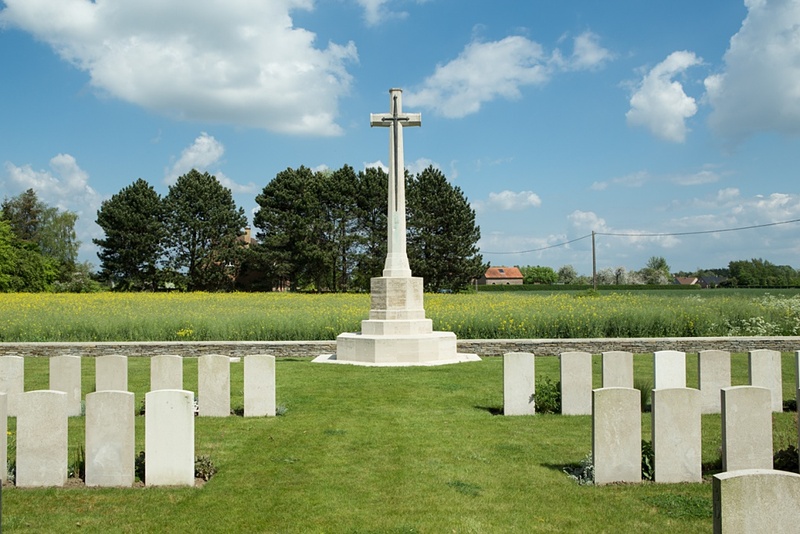 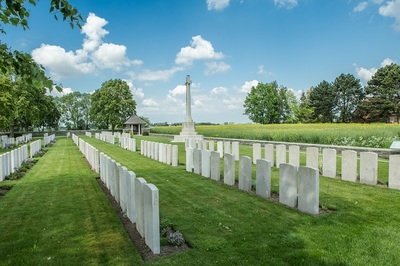 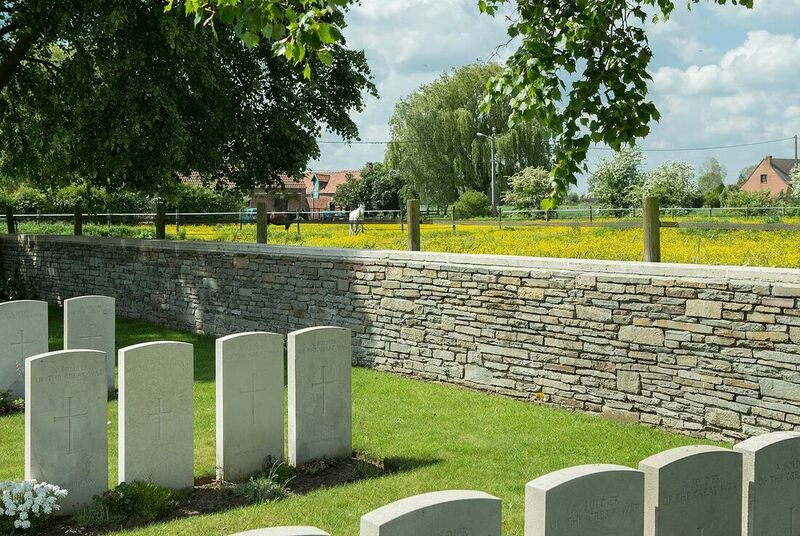 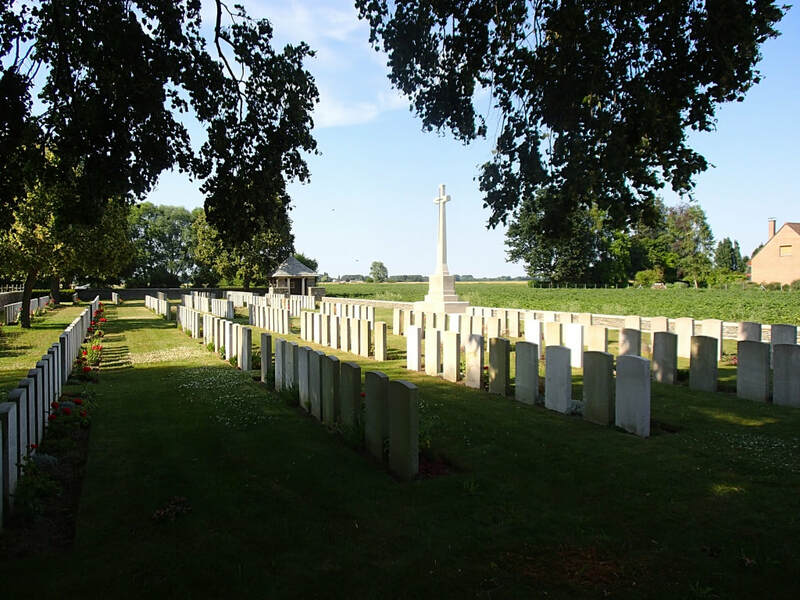 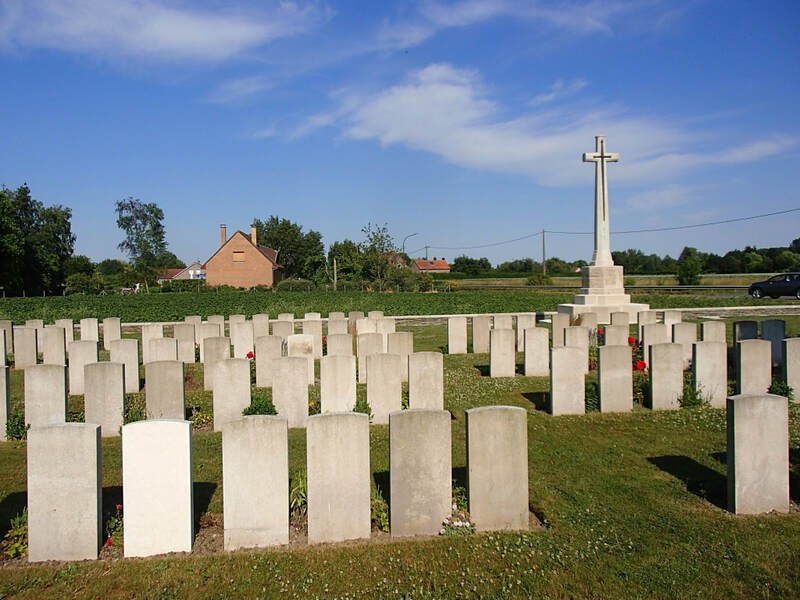 British troops began burying their fallen comrades here in April 1915 and the cemetery was used until the beginning of July, at which stage it contained the graves of 40 Commonwealth soldiers, almost all of whom had served with the Post Office Rifles. The gains made by Commonwealth forces during Battle of Festubert (15 – 25 May 1915) meant that the town was now less exposed to enemy fire and this sector remained relatively quiet until the German Spring Offensive of 1918. The cemetery was extended after the Armistice when graves were brought in from the surrounding battlefields, and in particular from the part of the line defended by the 55th Division in April 1918. 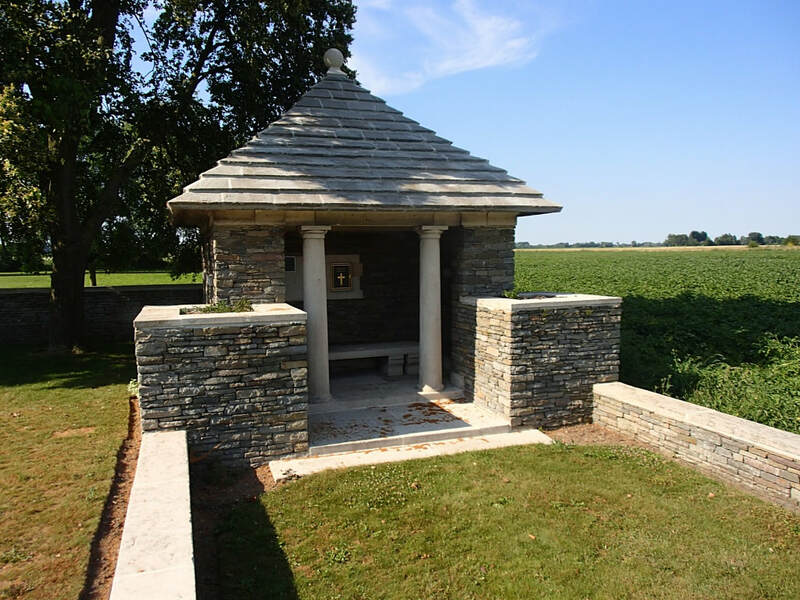 It was designed by Charles Holden and now contains more than 400 First World War burials, over 270 of which are unidentified. 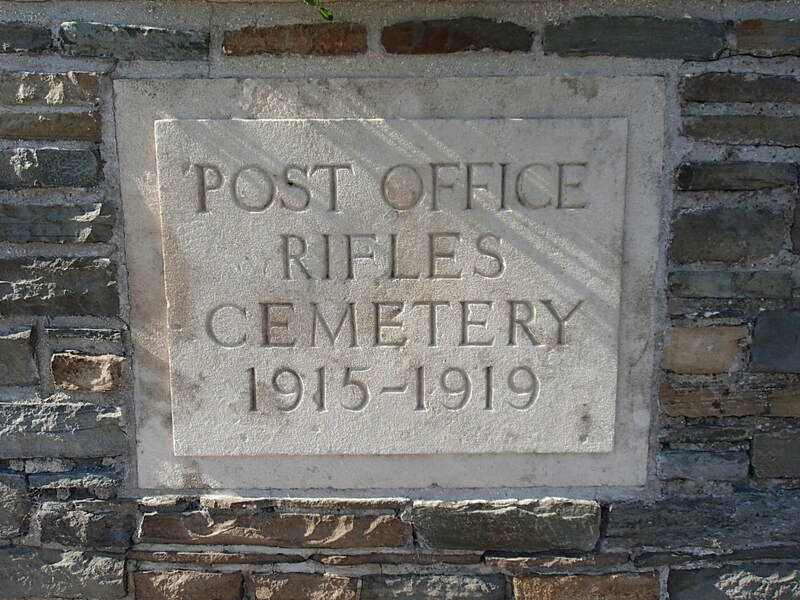 The officers of 1st battalion, the Post Office Rifles, came from a range of different backgrounds, but almost all of the rank and file riflemen were Post Office employees from London and many of them had worked together before the war. 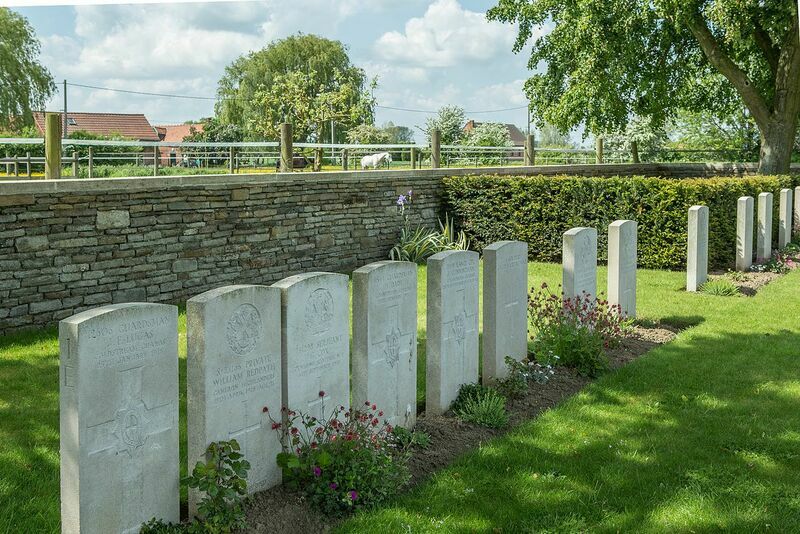 By the time the battalion arrived in France in March 1915, it had spent over four months training in Hertfordshire, during which time it had become a close-knit unit with its own individual character. 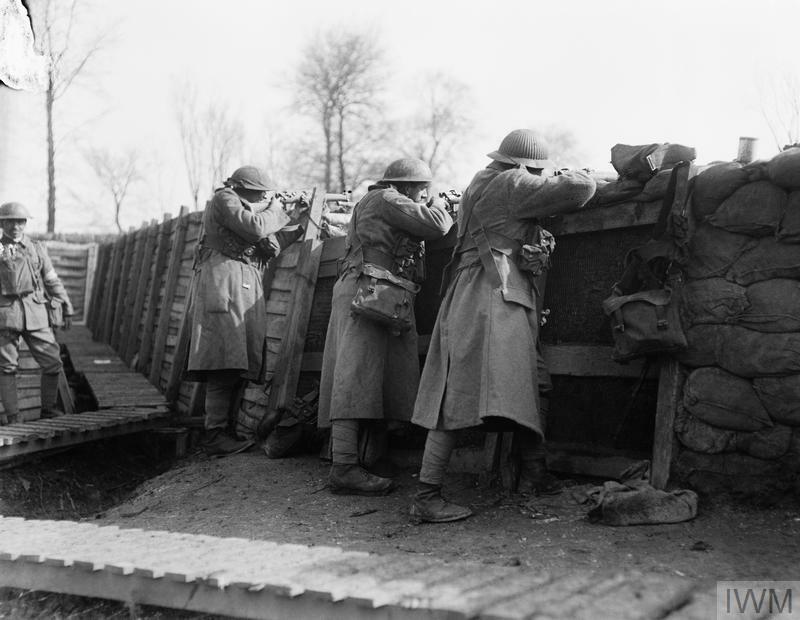 Within days of their arrival, the Post Office Rifles were ordered to occupy trenches just south of Festubert. 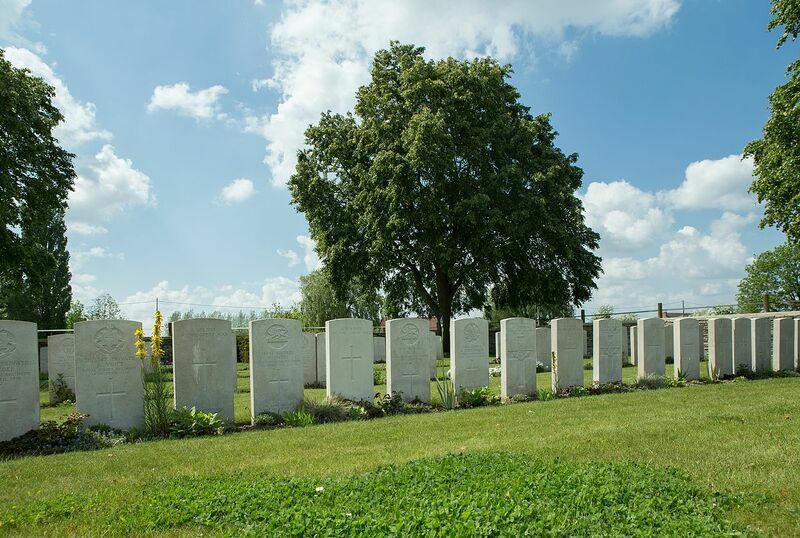 Over the course of the next six weeks, the men of the battalion became accustomed to trench warfare as they moved between the front-line and the relative safety of rest billets at Bethune and Auchel. As part of an ambitious Franco-British offensive, British and Indian units in this sector staged a major attack on the German positions along the Aubers Ridge on 9 May. 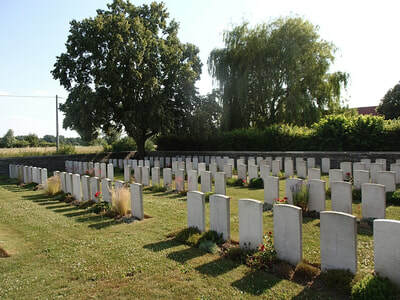 Commonwealth Forces suffered extremely heavy casualties from the outset and the Battle of Aubers Ridge effectively ground to a halt within 24 hours. 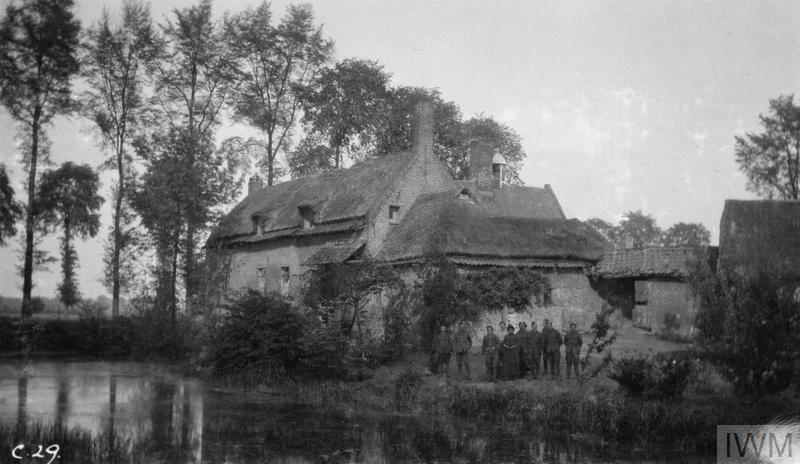 The French continued fighting further south in Artois, however, and the British High Command decided to renew their attack on 15 May. This second phase of the British part of the Allied offensive lasted for ten gruelling days and would become known as the Battle of Festubert. The Post Office Rifles entered the front-line trenches near Givenchy on 11 May. 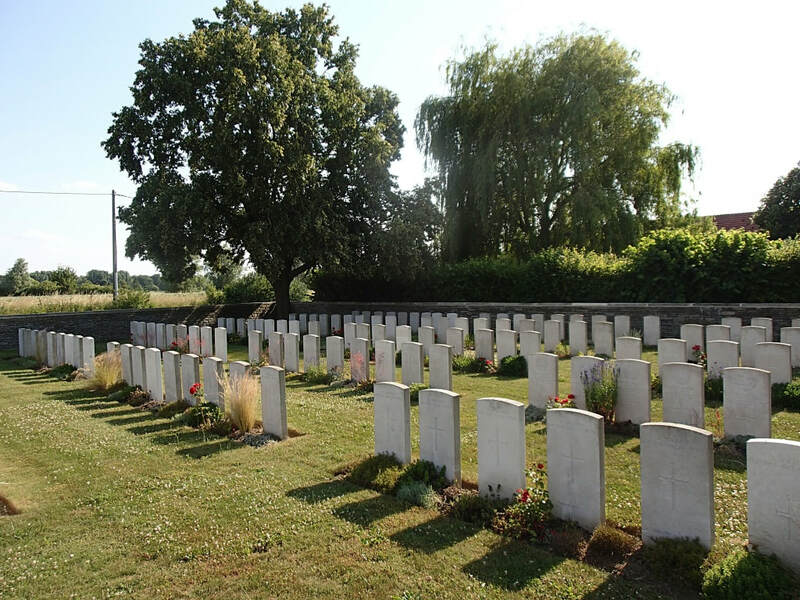 They did not advance with the main attacking force on the 15th, but heavy German artillery fire caused them to suffer numerous casualties as they held and attempted to strengthen the original British positions. 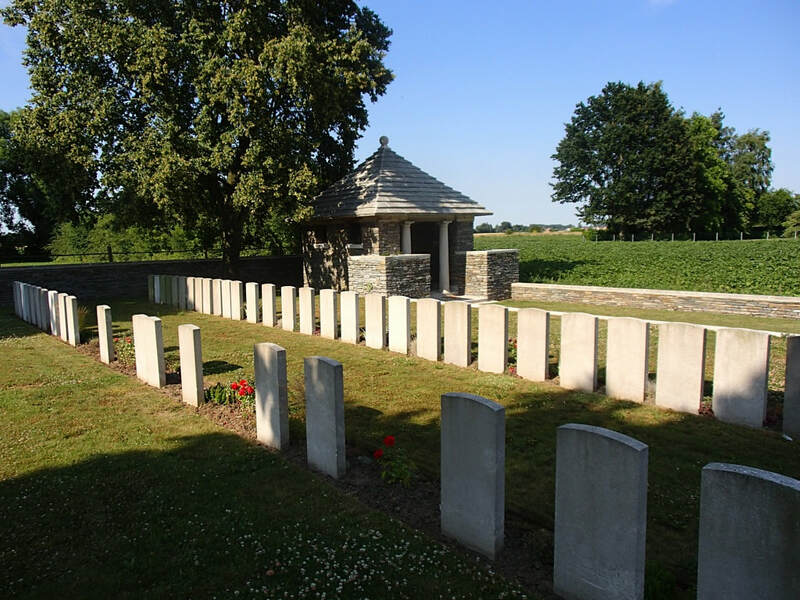 They were eventually relieved by Canadian troops on 20 May and marched back to Gorre for some much-needed rest. 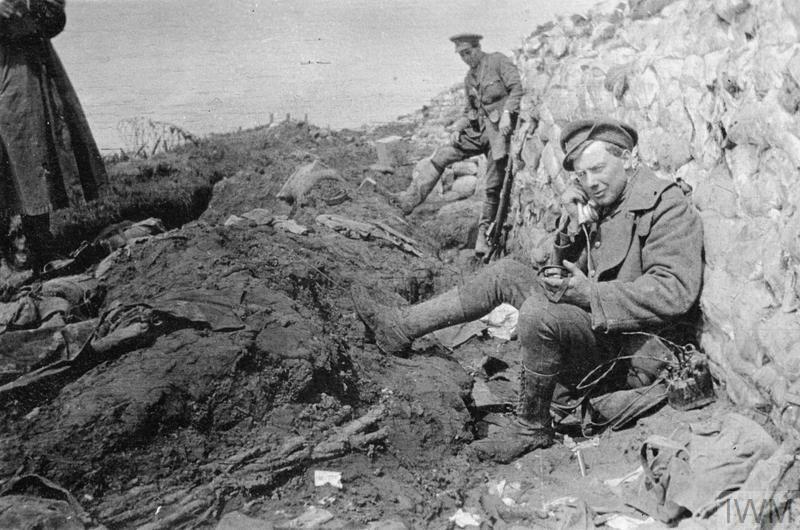 Less than two days later, the battalion was ordered back up the line to assist the Canadians in clearing enemy troops from a newly captured network of trenches. 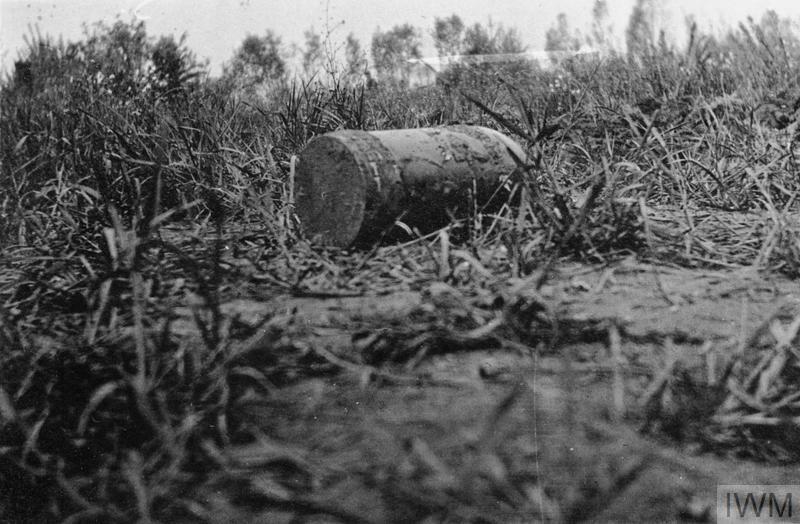 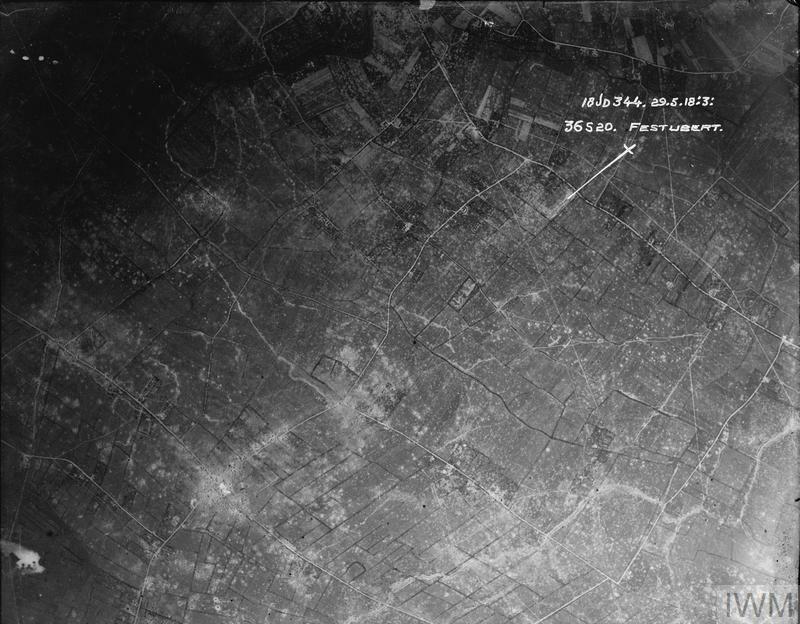 On the morning of 24 May, units of the Post Officer Rifles, joined by their Canadian comrades, began bombing and bayoneting their way from trench to trench. German infantrymen based in well-defended trenches - known as J3 and K5 - put up determined resistance and machine-gun fire claimed the lives of dozens of Commonwealth troops. 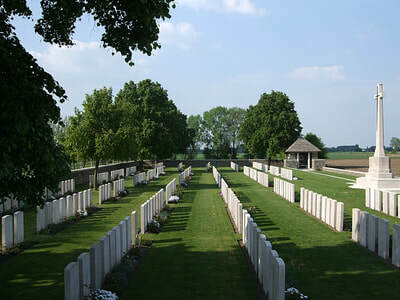 Finally, on the afternoon of 25 May, the surviving German soldiers surrendered and the Battle of Festubert came to an end. 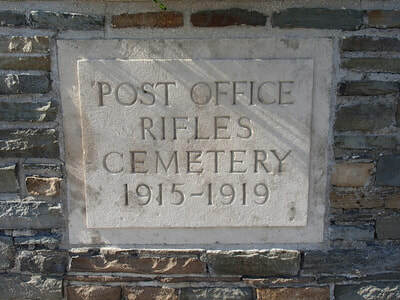 Of the 900 officers and men of the Post Office Rifles who had entered the trenches over two weeks before, some 600 had been killed or wounded. Casualty Details: UK 398, Canada 1, India 1, Total Burials: 400. 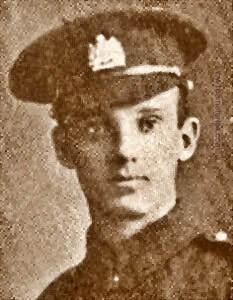 13th May 1918, aged 21. 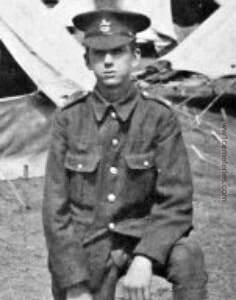 Son of Ernest Nightingale Cooper and Martha Annie Cooper (nee Briercliffe), of Nether Shatton, Bamford, Derbyshire. 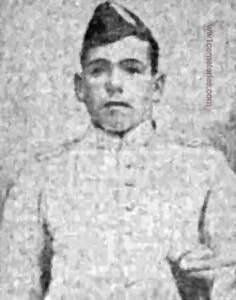 Native of Bolton. 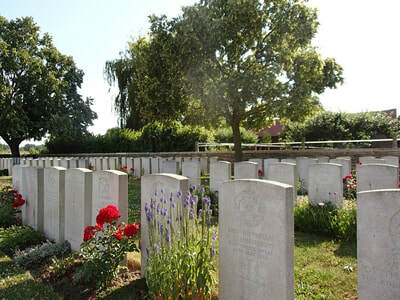 ​His headstone bears the inscription; "In Memory Of Our Dearly Loved Son, Roy. 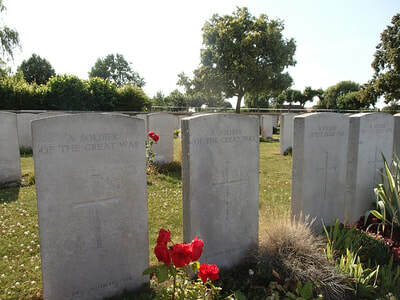 Until The Day Dawns." ​His headstone bears the inscription; "There Is Sweet Rest In Heaven For Our Loved One." 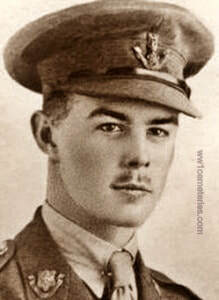 11th December 1917, aged 24. 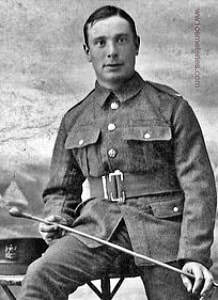 Son of Norman and Annie Mackenzie, of 66, Kenneth St., Stornoway, Isle of Lewis. 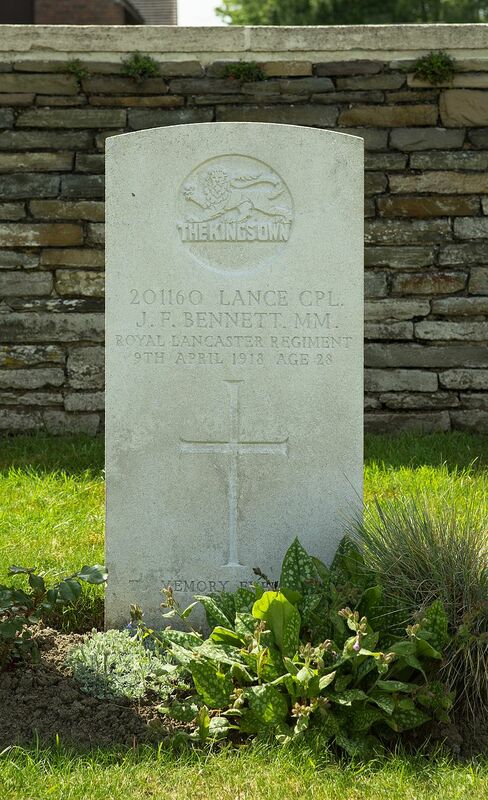 His headstone bears the inscription; "Sleep On Dear Son God Thought It Best To Take Thee To Thy Heavenly Rest." 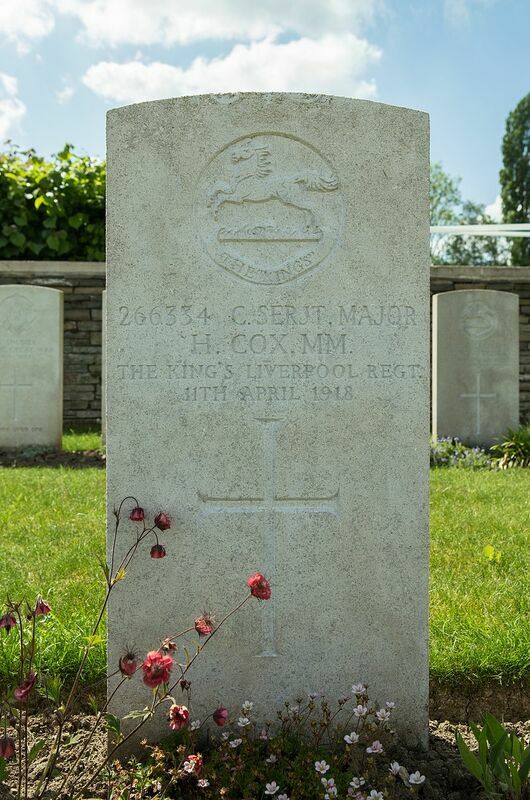 24th May 1915, aged 30. 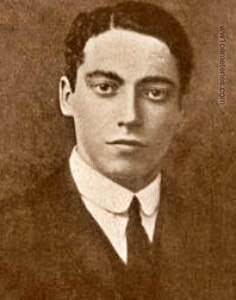 Son of Sir Ernest Moon, K.C.B. and Lady Moon, of Braziers Park, Ipsden, Wallingford, Berks. His headstone bears the inscription; "Brave, Honourable And Beloved." 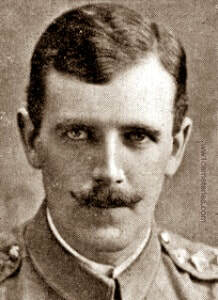 29th November 1914, aged 32. 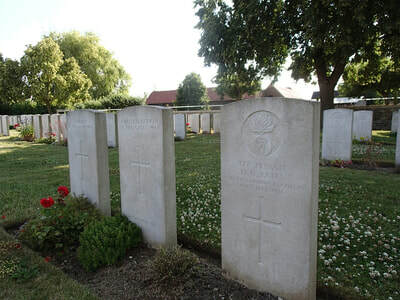 Son of Christian Mortimer, Canon of Lichfield, and Lucy Mortimer, of Hill End, Woking, Surrey. 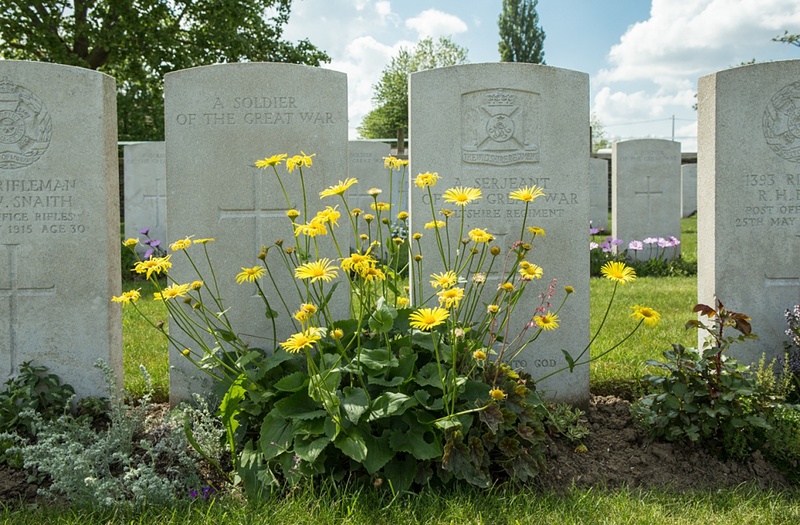 His headstone bears the inscription; "Very Dear Son Of Christian And Lucy Mortimer Jesu Mercy." 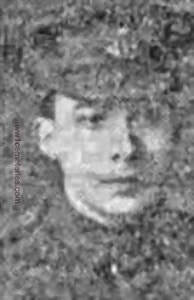 John William Payne, M. M.
4th May 1915, aged 21. 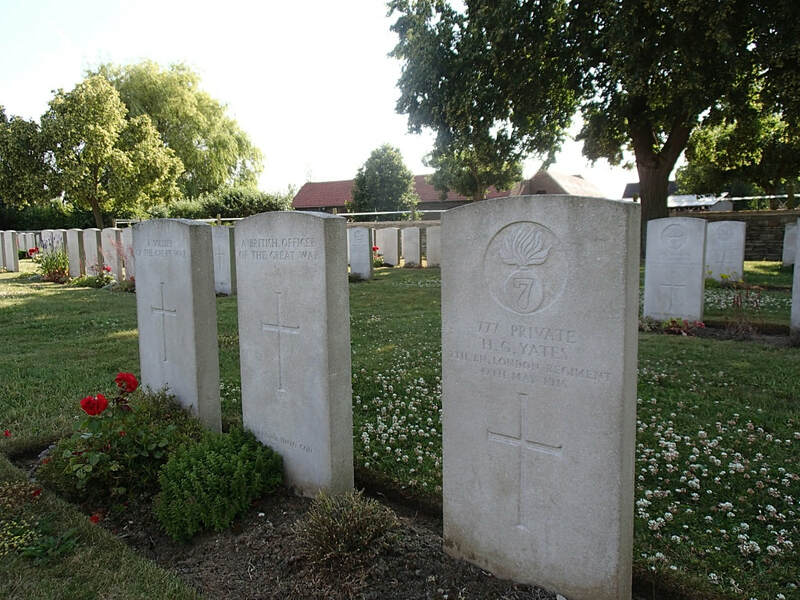 Son of Kate Broadhead Stevens, of "The Langdales," 5, Epsom Rd., Croydon, and the late Edward Stevens. His headstone bears the inscription; "Grant Him Eternal Rest O' Lord." 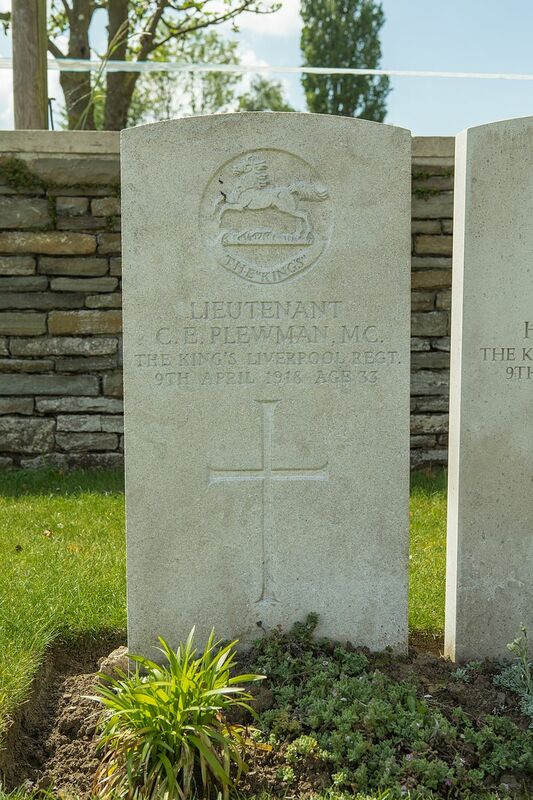 9th April 1918, aged 26. 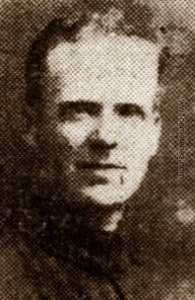 Son of Robert and B. Thoms, of 23, Scott St., Dundee. 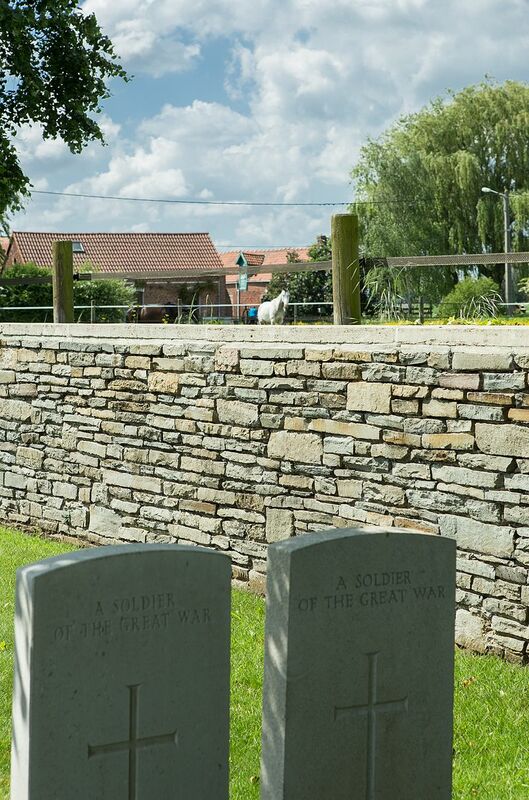 His headstone bears the inscription; "In Loving Memory." 27th November 1914, aged 27. 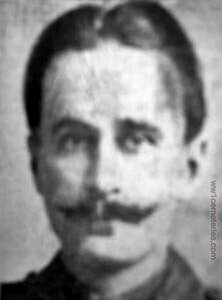 Son of the late George and Elizabeth Wallace, of Dundee. 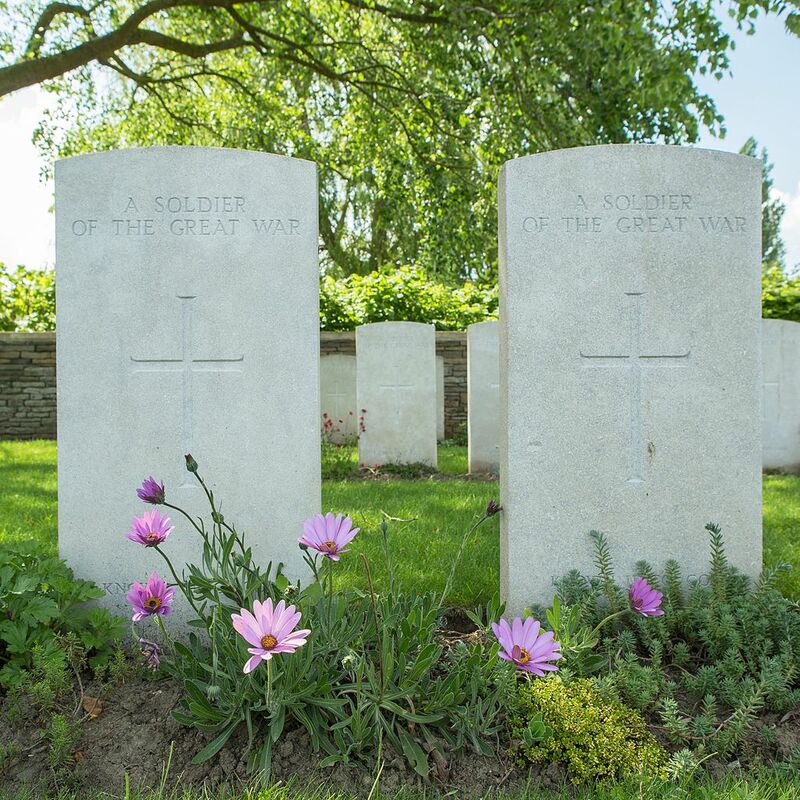 His headstone bears the inscription; "He Liveth Still."